Everyone loves brownies. And every busy mom needs a brownie recipe that she can fix in hurry. This is it. Mix it in one bowl in about ten minutes. 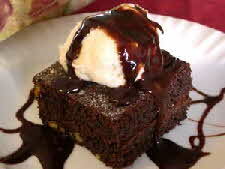 Best of all, this is a rich, moist brownie that everyone will like. 1. Melt the butter and chocolate together in the microwave in a large bowl stirring once or twice. 2. Stir in the sugar then the flour and baking powder and then the eggs. Stir in the vanilla and walnuts. 3. Pour into a greased 8 1/2 by 13-inch pan. Bake for 22 to 25 minutes or until done. Do not over bake. Dust with powdered sugar if desired.